'Other Nobel' — the U.N.'s Nansen Refugee Award — Goes To Surgeon In South Sudan : Goats and Soda Dr. Evan Atar Adaha has won the U.N.'s Nansen Refugee Award. Of his commitment to work in a conflict zone, he says: "I would feel guilt the rest of my life if I left people in this situation. 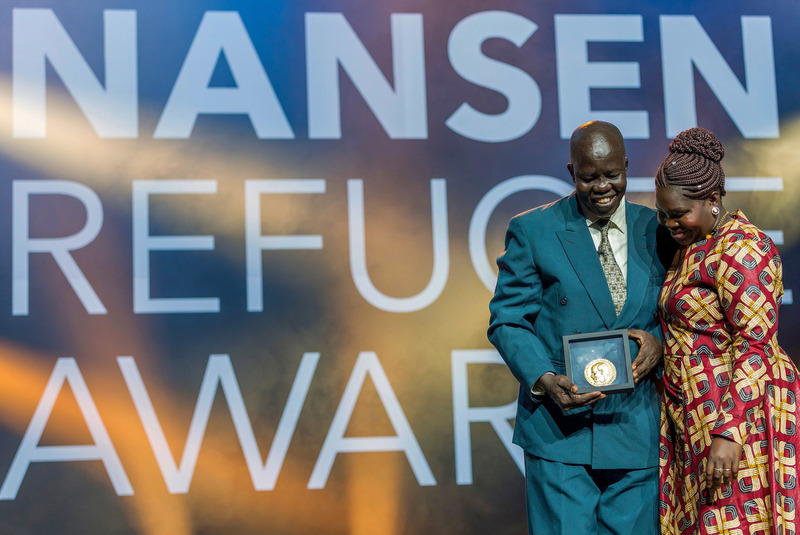 Evan Atar Adaha, surgeon and medical director at a hospital in South Sudan, accepts the U.N.'s Nansen Refugee Award in Geneva, on October 1. His wife, Angela Atar, is at right. South Sudanese surgeon Dr. Evan Atar Adaha, 52, recalls that when he announced his decision to embark on humanitarian aid work in 1997 amid the civil war in Sudan, his friends told him, "You will die if you go there. It is too dangerous." He went anyway — and is still there. Last month, Atar received the U.N. Refugee Agency's Nansen Refugee Award, in recognition of his more than 20 years of providing medical care for displaced people and refugees amid the ongoing conflict in Sudan and South Sudan. Today, Atar heads the only functioning surgical facility in South Sudan's Upper Nile State, serving a population of more than 200,000, including approximately 144,000 refugees. Always on call, working 12-hour shifts seven days a week, he himself does about 12 surgeries a week and oversees the 120-bed and two-theater facility, which also includes a neonatal section and tuberculosis ward. All told, he and the staff perform about 58 surgeries per week and also see and treat patients from four refugee camps. Originally from Torit in South Sudan, Atar had studied medicine in Khartoum and practiced in Egypt before volunteering to do humanitarian medical work in Kurmuk, Sudan, during the civil war in 1997. In 2011, intense fighting forced him and his staff to relocate the hospital he had founded there to its current location in Bunj. Although his patients familiarly call his clinic "Dr. Atar's Hospital," its official name is the Maban Referral Hospital (located in Maban county). Conflict continues throughout the area as part of South Sudan's ongoing civil war, which has displaced approximately four million people. Atar nonetheless carries on despite challenges that include limited supplies, spotty electrical power and an x-ray machine in need of repair. "Dr. Atar's work through decades of civil war and conflict is a shining example of profound humanity and selflessness," said Filippo Grandi, the U.N. High Commissioner for Refugees. "Through his tireless efforts, thousands of lives have been saved." NPR spoke to Dr. Atar when he was in Juba, via Skype. The interview has been edited for length and clarity. The Nansen Prize is sometimes called the "other" Nobel Prize. Do you think you will ever win the Nobel? I had never dreamed of the Nansen Prize, and about the other Nobel I don't know. I was really humbled by this prize. This award is not for me alone but for our team and for those who help us, we are working together. What is important is that I will continue my work, and the work will be better because we will use the $150,000 prize to buy machines and equipment and to train nurses and midwives. What drives you to work amid these difficult conditions? But from the very beginning, I saw these people have nowhere to go. You can't tell them to go away [and find help elsewhere]. The wars have destroyed other local hospitals, and the people have no resources to drive six hours away to Malakal or to Juba for medical help. If you do not help them here, they will just go and die at home. I would feel guilt the rest of my life if I left people in this situation. I look at them and see in them my mother or another family member. They become part of my family, and I become part of them. How can I leave them? I have to help them. How do you deal with the limitations of medical supplies and equipment? At the beginning I was really struck by what we did not have, the equipment and supplies we lacked. I had to learn to meet the limitations on the way. We improvise depending on the situation. When we don't have general anesthesia, we use ketamine injections and spinal epidurals. We can re-use IV bottles as bottles for drainage after surgery. For tubing [for a catheter, for instance] we can use a hollow grass stem. And now the Nansen Prize will help. You are a believer in spending time with your patients to understand their situation. If the patient believes he will get help from you, the recovery will come faster. When the patients ask questions, you must take the time to explain, and you must understand not just the disease but the background of what has happened [in the patient's life]. For instance, there was one man whose legs needed to be amputated. He had [stepped on] a landmine and there was no other option. After the operation, he saw he had no legs and he was crying, he could not stop. As I sat with him, we talked about his life, how much he loved his kids. And it came out that on the day of his injury he was in such a rush to get home to see his kids that he had taken a shortcut and it turned out to be a minefield. We talked some more and he started to understand that he could still go home and be with his kids, and his motivation was so high that he healed very quickly. There are many examples like that. How do you remain optimistic amid so much medical need? There is no way to live in this situation without hope. You must admit the difficulties and the challenges, but you also must try to overcome them. In the absence of what would be the best way to accomplish something, you use what you have in order to achieve it. Do you fear for your own safety? We have to do what we think is correct, and where there is war, that is where we are needed, and where the people are most in need. If you run away, there will be no way for them to survive. I strongly believe I am safe despite everything. Death and life are not in my hands; they are in the hands of God.